Xu Fu Long Ya is a fairly new tea, having just been introduced by Xu Fu Tea Industry in 1997. In the short few years, it has already won multiple awards and is now one of Si Chuan province’s Top Ten Tea. The name Long Ya literally translates to "Dragon Tooth", a name given due to the unique appearance of the leaf, which resembles the fang of a dragon. This tea is special not just for its exceptional quality, but also for its reputation as one of the earliest spring tea to hit the market every year. The tea leaves are hand-plucked by Miao Minority young ladies with small hands and fingers in the middle of February every year and processed by Xu Fu Tea Industry’s best tea masters. The organic tea farms have been around for around 1600 years. These farms are located high in Xi Huang Shan (West Yellow Mountain) between 1200 to 1350 meters. Only the leaves from such high elevation farms can have such vibrant emerald-green color. A harvest from 60 acres farm land can only produce 500 grams of Xu Fu Long Ya. This tea is certified organic by China Agriculture Quality Department and adheres to ISO 9001:2000 standards for quality management. This is the absolute finest grade from the company. We were astounded by the mouth watering, extremely fresh fragrance of Xu Fu Long Ya as soon as we opened the bag. Once brewed, the fresh aroma fills the air of our tasting room. The taste is wonderfully sweet with a slight hint of pleasant vegetal undertone. The aroma of this tea matches the taste closely. We managed to get up to four infusion with little loss of quality. Deservingly so, a top tea from Si Chuan province and a gift from mother nature. 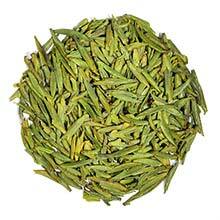 Flat and straight, emerald green color tea leaves. Very fresh.